Objective: Score goals with Messi or Ronaldo and try to win the tournament! 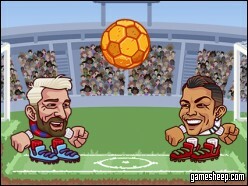 We are glad that you have chosen to play Heads Arena - Soccer All Stars on GameSheep.com, the most dynamic website available. If you like this game Heads Arena - Soccer All Stars don't forget to rate it and this way you will help with selecting only the best games for the home page.